I went to bed with my noise cancelling earphones so I managed to sleep longer. The noise from the neighboring Orthodox church is defeating and the priest could use some singing classes. After breakfast, we headed to Key Afer, one hour drive, to visit the largest market in the valley. The Thursday market is visited by Banna and Ari, although I spotted a Hammers as well. 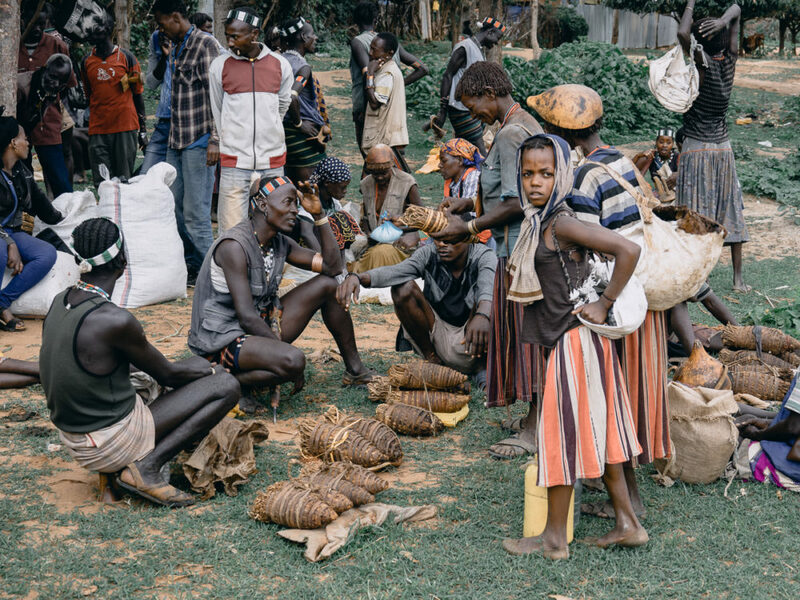 Key Afer is the largest weekly market in the lower Omo valley. Banas on market day in Key Afer. The market area is quite large but it was half empty when we arrived. 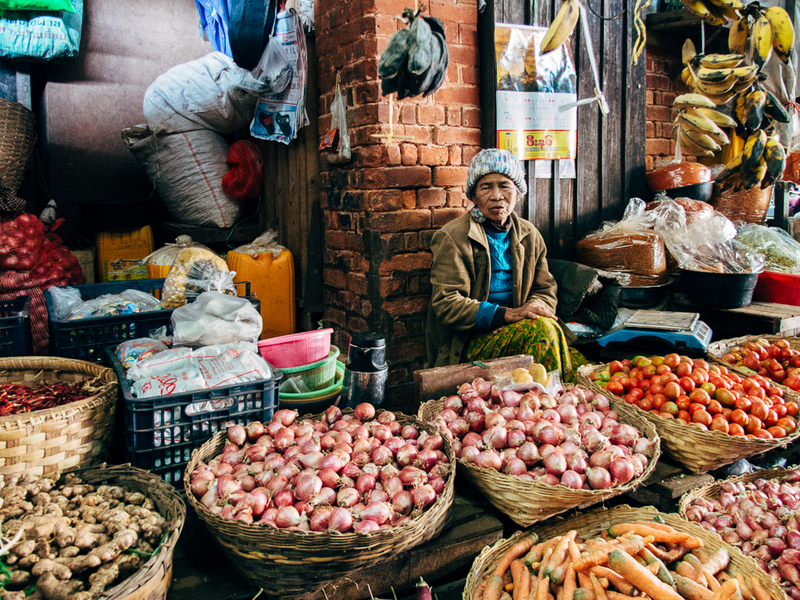 It did not have the ambience and energy of the Aldubi market, but still there was a lot to see. Coming early was good for visiting the animal market. Most of the traded livestock consisted of goats and some cows. Cows are mostly traded during the holiday season when prices go up. 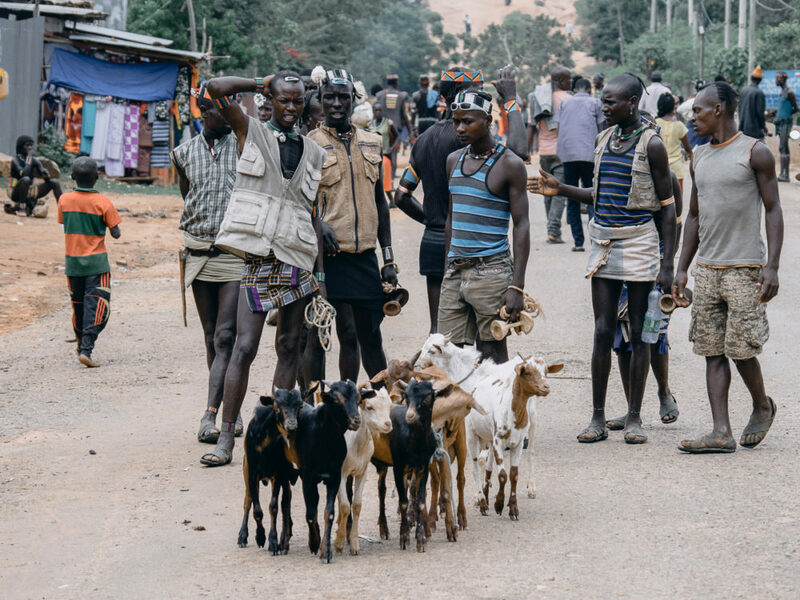 A goat’s running price was about 700 birr locally but the buyers from Addis Ababa will sell them for a hefty profit at 2000-2500 birr when back to the capital. Banas in the animal market in Key Afer. In the animal market in Key Afer. A Hamer woman in the market in Key Afer, wearing her first wife necklaces. 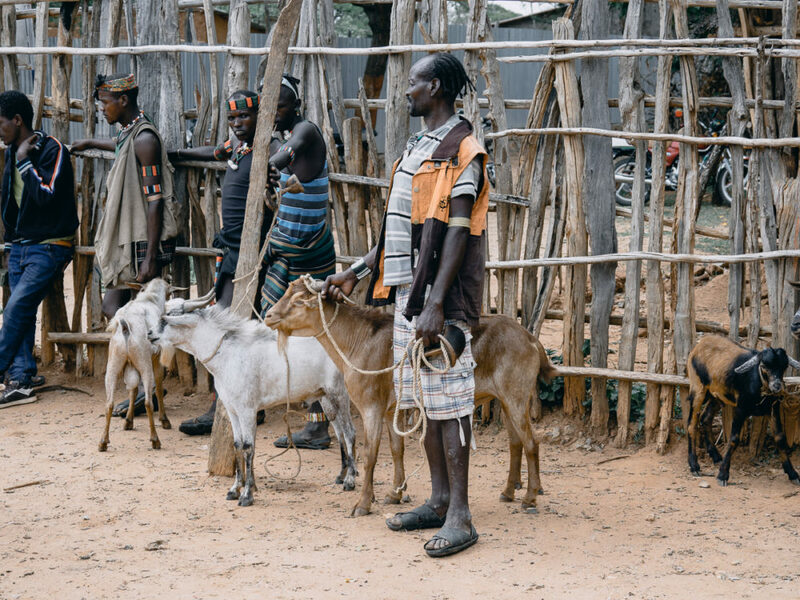 One trader had a fat stack of 100 birr bills to count to sellers after each goat was roped and weighted by a hanging balance. A government tax collector was sitting in tented kiosk right outside the market entrance to collect 20 birr per transaction. 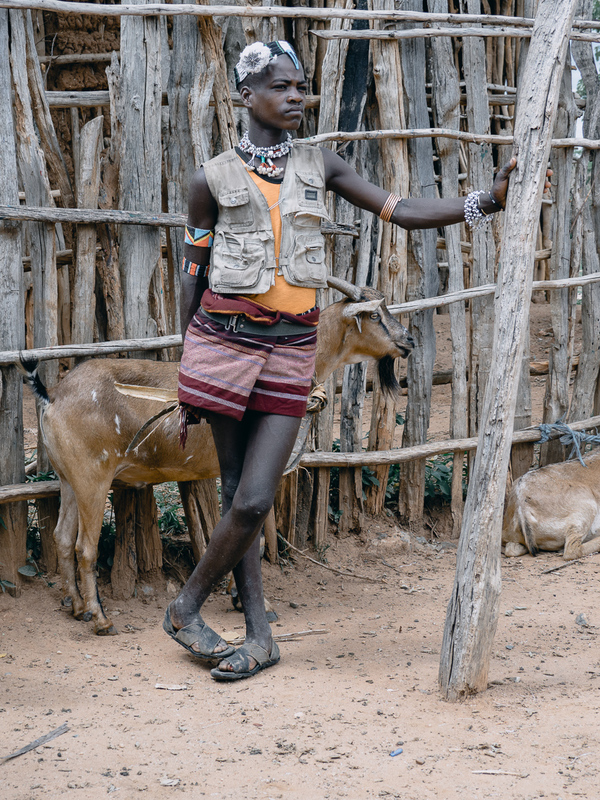 There were only men in the animal market and most of them had come to sell a single goat. They were dressed traditionally, wearing their short skirts and headbands, but most of them had added a western gadget to their attire. 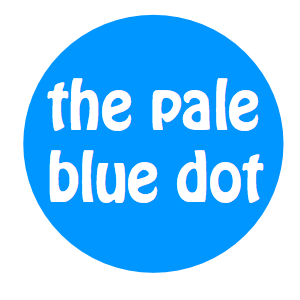 A pair – or in some case two – of plastic sunglasses that they were holding on or at the back of their head. The decoration was so popular that I think it is the newest fashion fad in the valley. Market day in Key Afer. 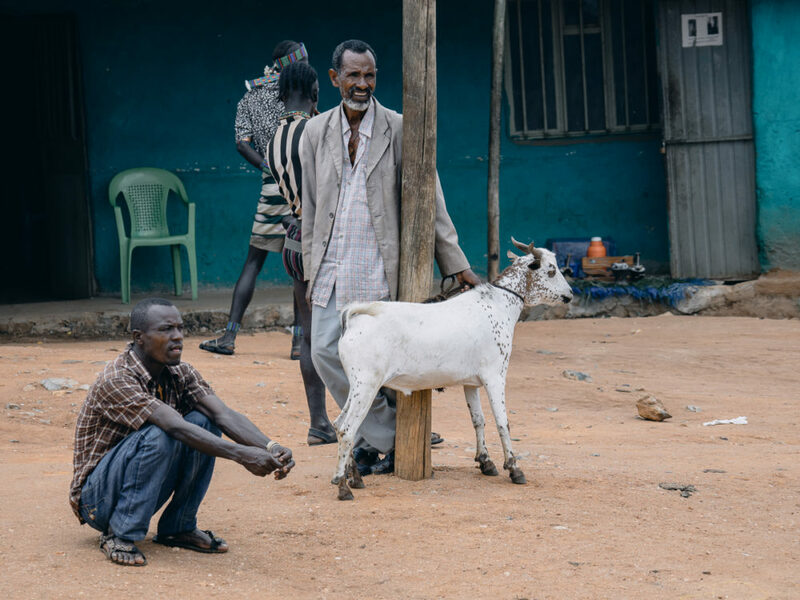 A guy and his goat In the animal market in Key Afer. 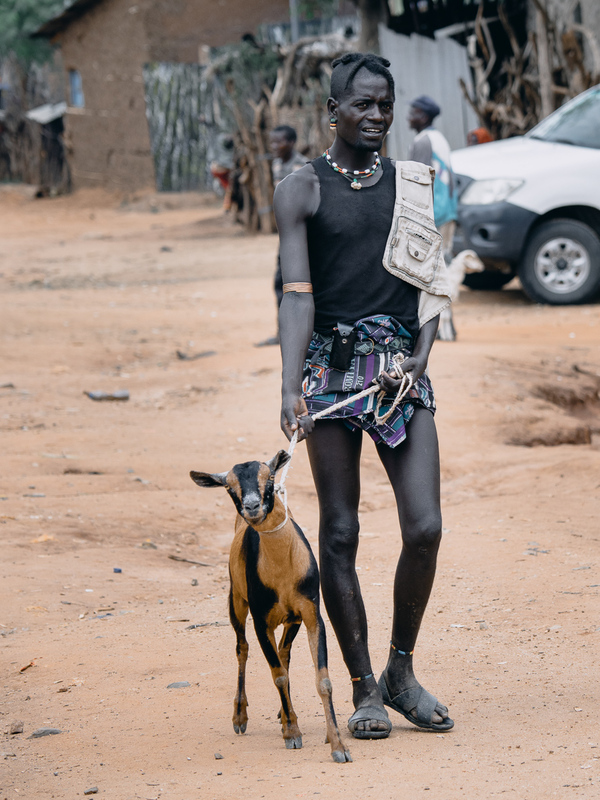 A Bana bringing his goat for sale to the animal market in Key Afer. Banas bringing their goats to the animal market in Key Afer. 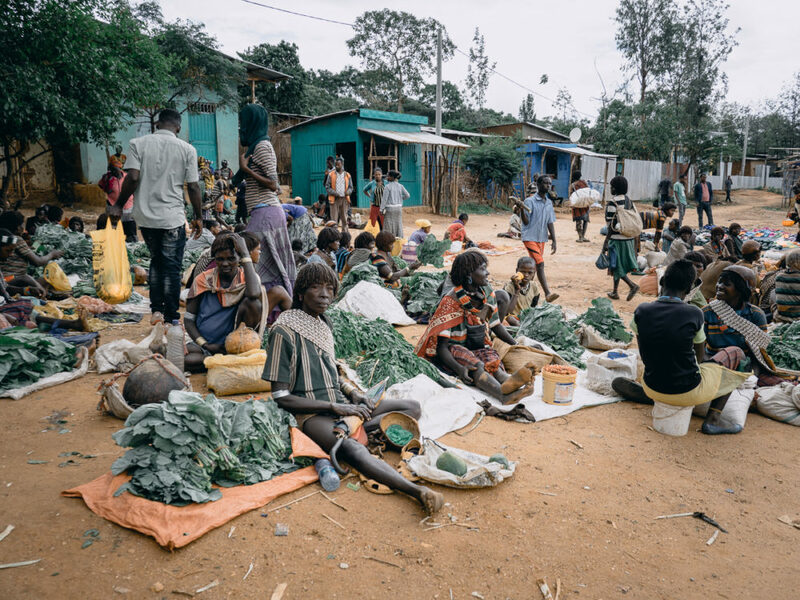 We spent a couple of ours in the market, took some decent pictures of the action and then drove back to Arba Minch to spend the evening. 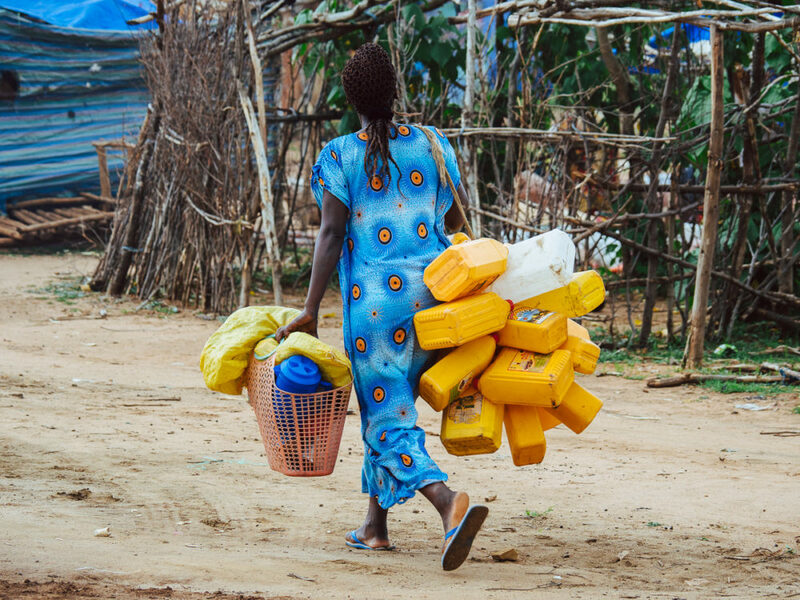 An Ari woman carrying jerry cans in the market in Key Afer. Banas selling their stuff in the market of Key Afer. 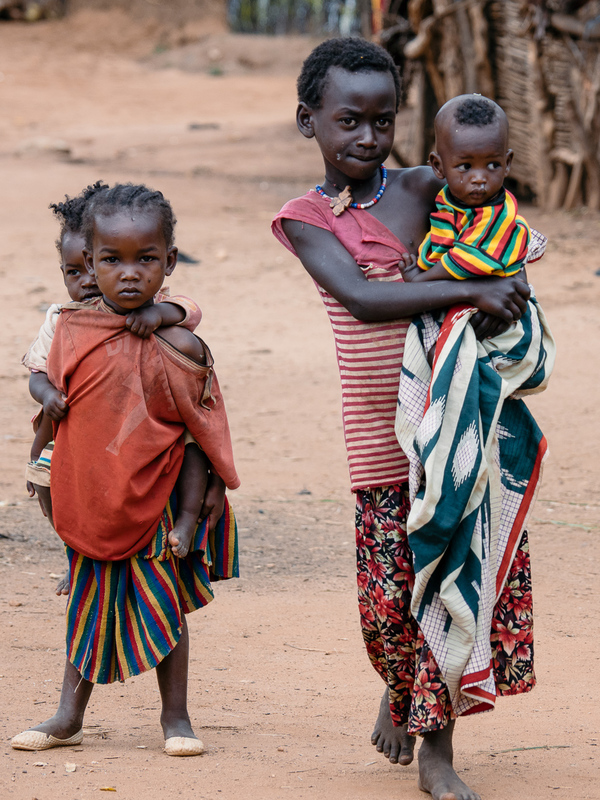 A young girl carrying her sister in Key Afer. Banas flirting in the market in Key Afer. A cool guy in the Key Afer market. Banas in the market of Key Afer. An elder Ari in the market in Key Afer. 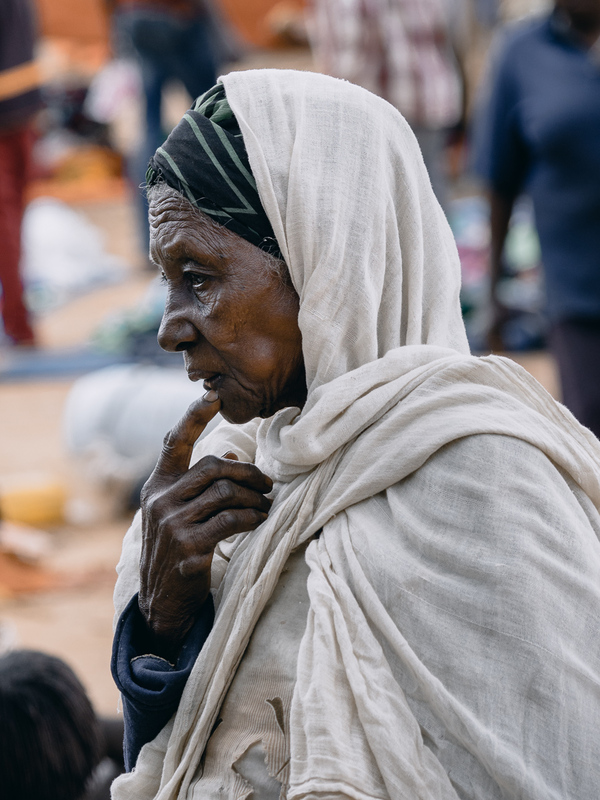 A Bana woman in the weekly market in Key Afer. 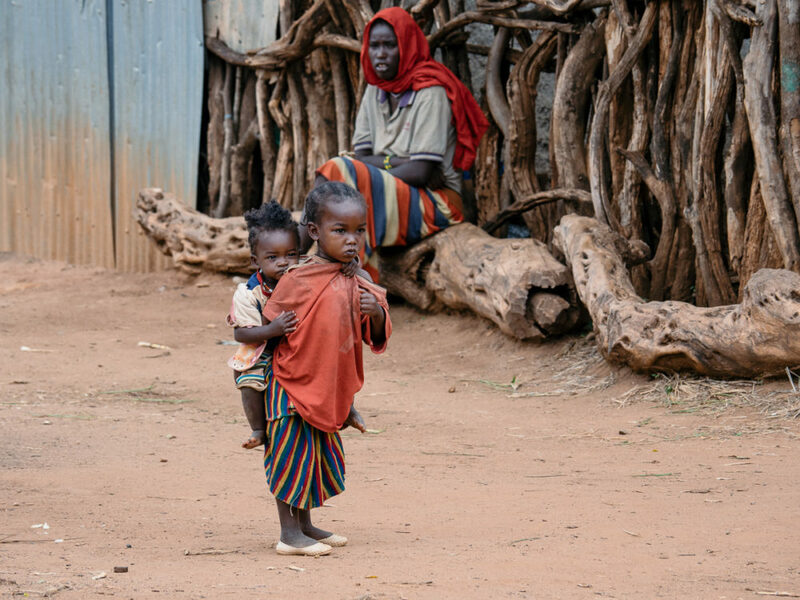 A Bana mother with her kid in Key Afer. Two Banas chatting in the market of Key Afer. 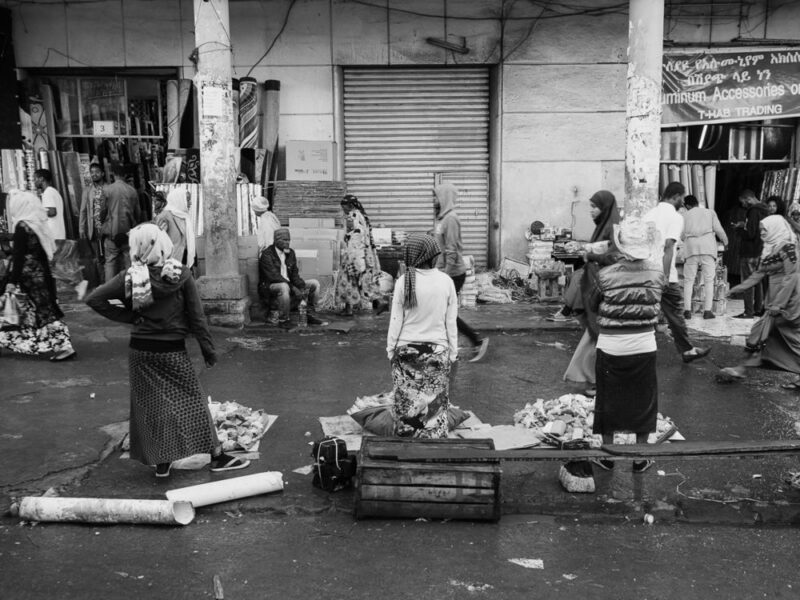 Bana women arriving in the market of Key Afer. 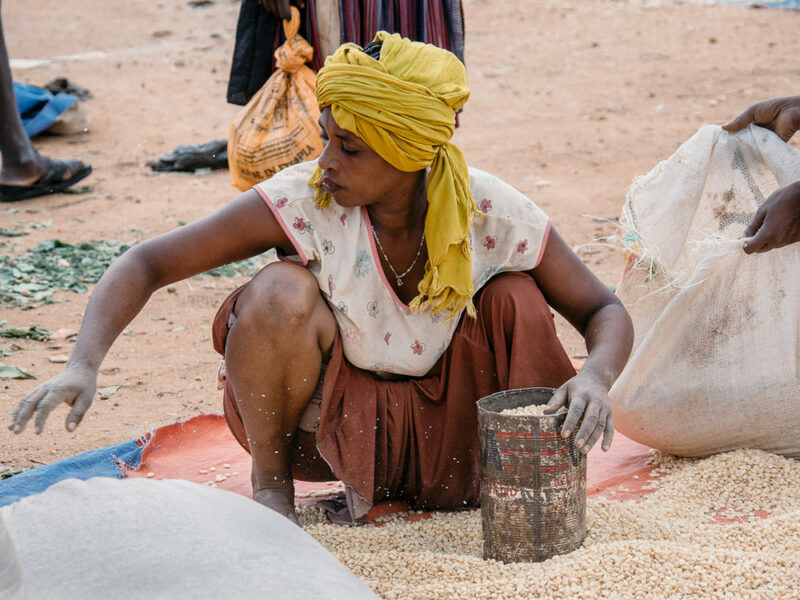 A Bana woman at the market in Key Afer. 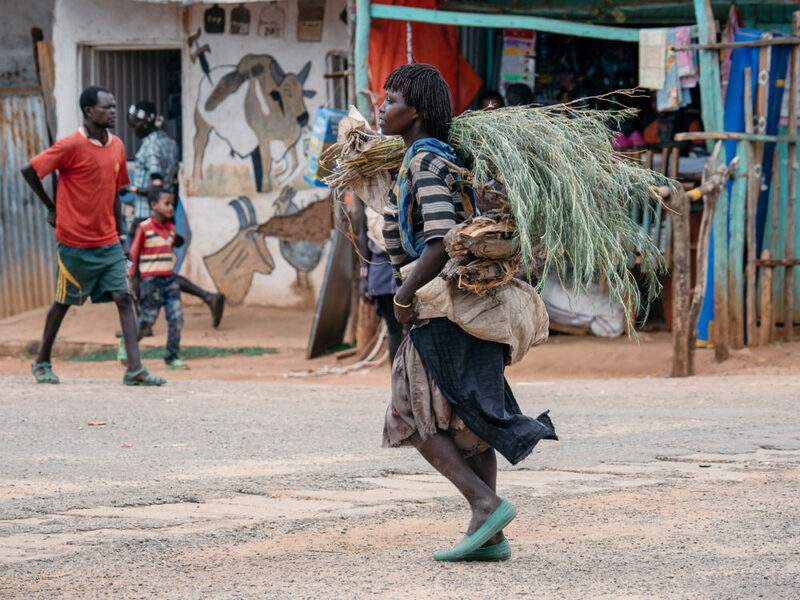 A Bana woman coming to the market in Key Afer. 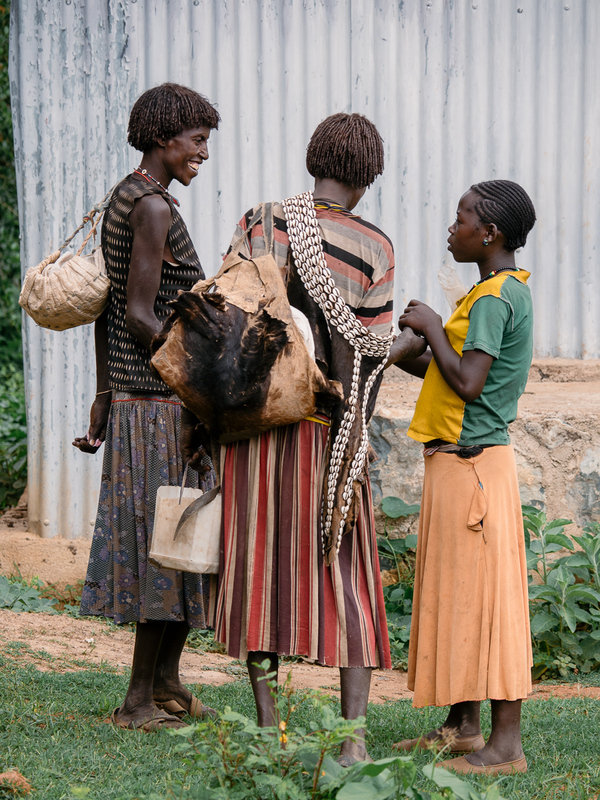 Women chatting in the market of Key Afer. 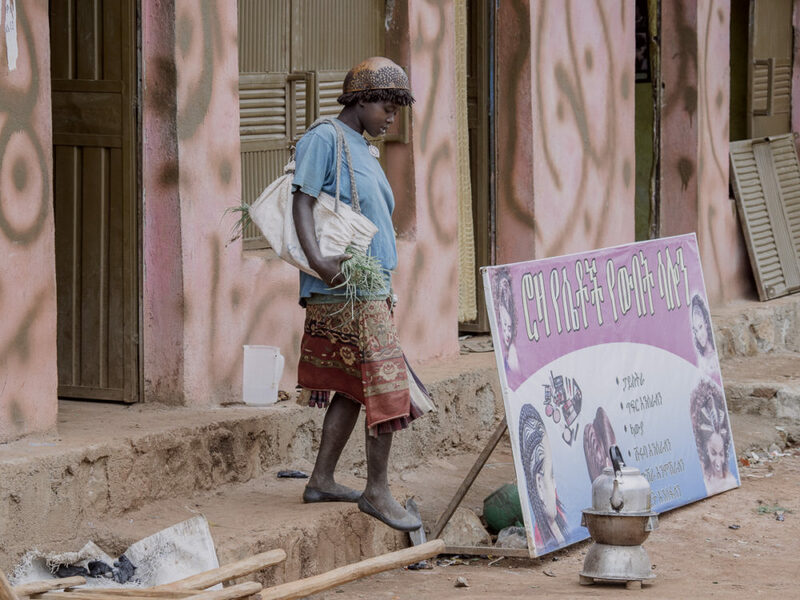 An Ari woman in the Key Afer market. At the market in Key Afer. 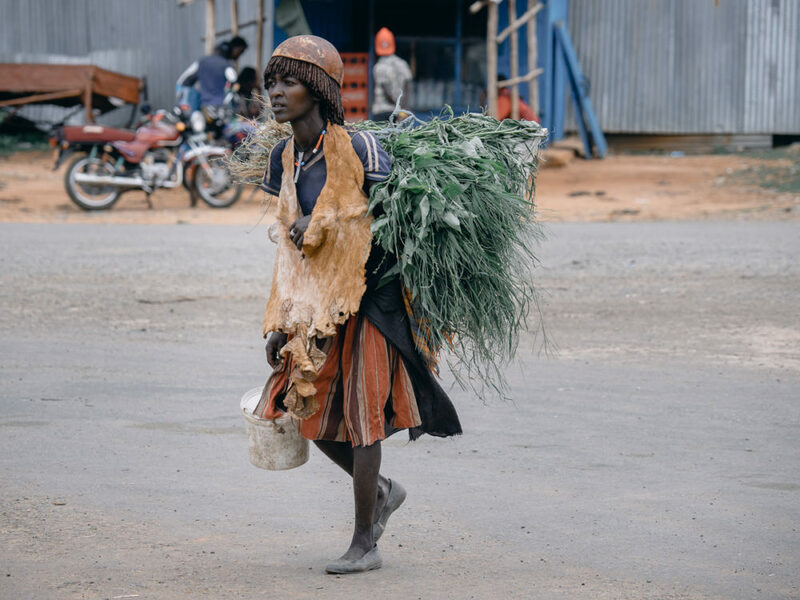 A Bana woman in Key Afer's weekly market. Girls carrying their younger siblings in Key Afer. 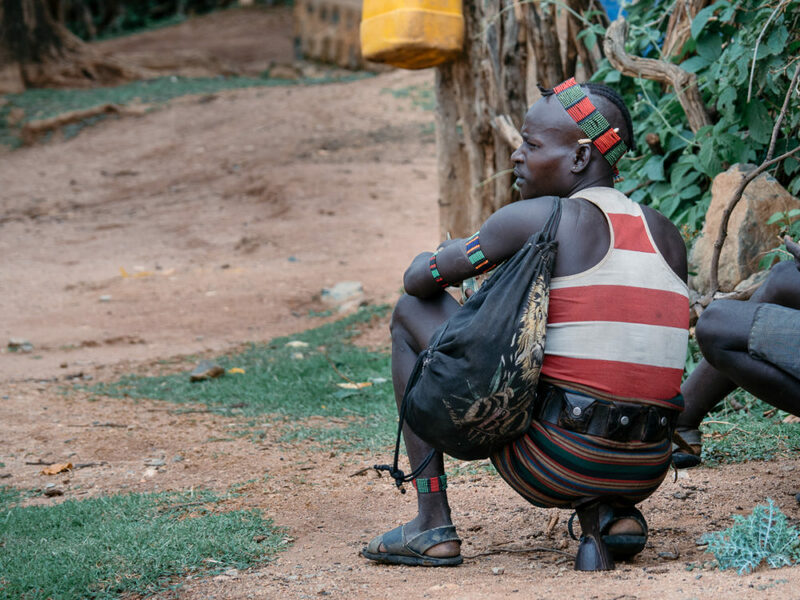 A Bana resting at the market in Key Afer. A young Bana kid in Key Afer. 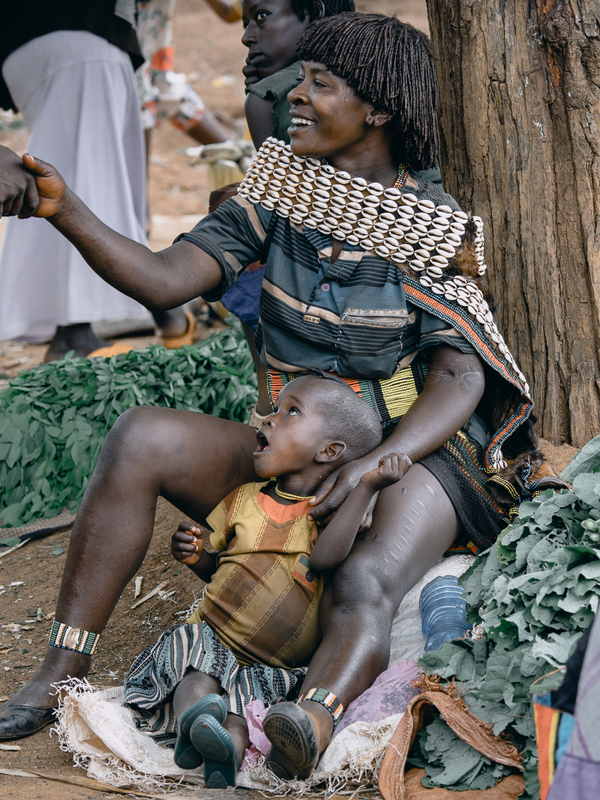 A Bana woman in the market in Key Afer. Just before arriving at the lodge, we crossed a huge crowd of people leaving the football stadium. 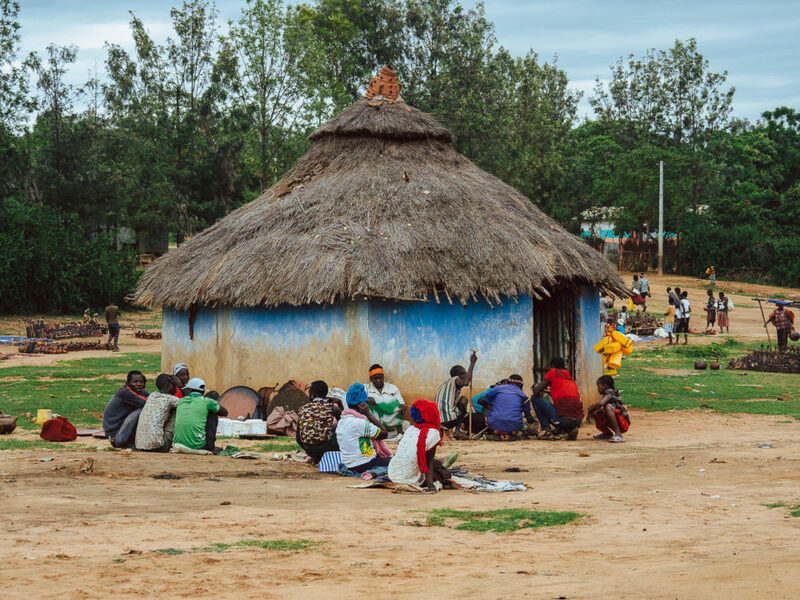 They were gathered there by the government to contribute to the building of the new hydroelectric power dam that will change the valley forever. There is a lot of debate about it. 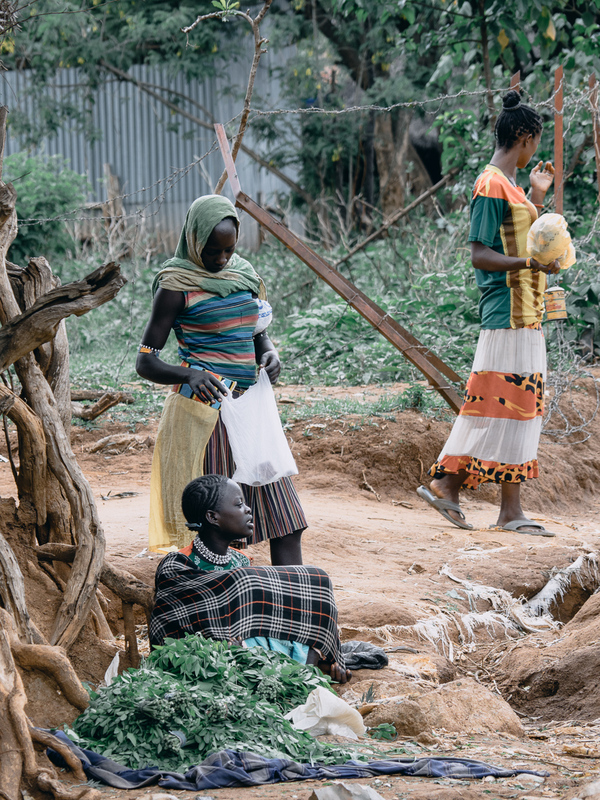 The tribes that rely on the floods of the Omo river do not want it, since it will change the seasonal flood pattern. 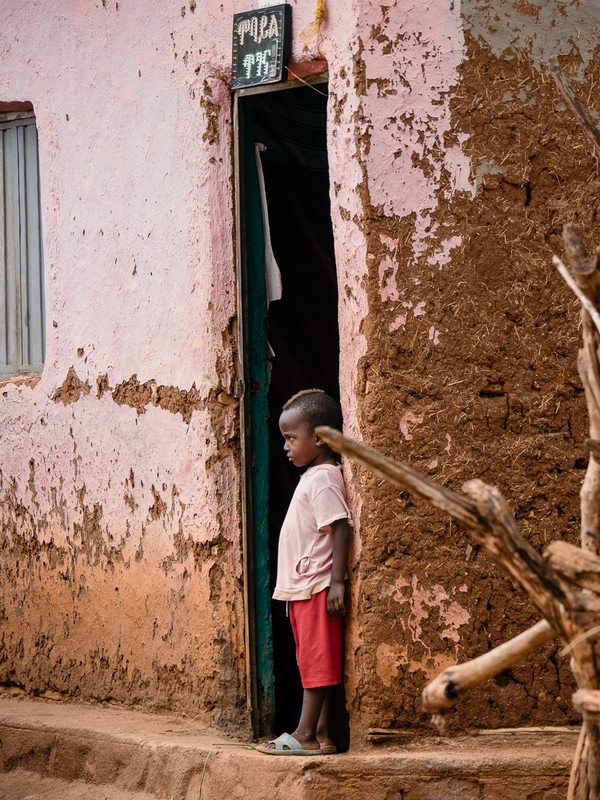 Those that rely on flood retreat cultivation will lose yet another source of income. 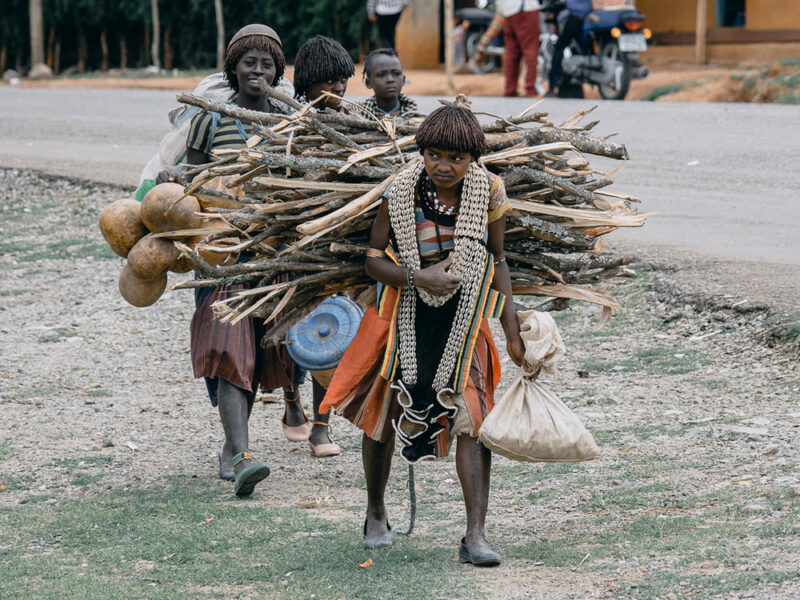 But Ethiopia is short of electricity power and people in the north will benefit. Progress against conservation, I came across the same debate time and again in the developing countries. I do not have the facts and I am no expert to express an opinion, but for sure the tribes will come one big step closer to losing their identity. 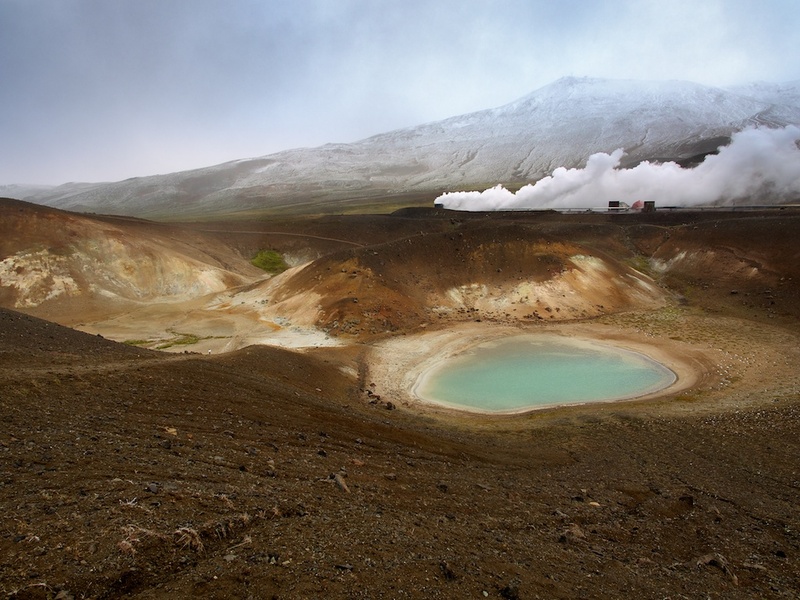 The next morning we drove to the entrance of Nechisar National Park surrounding Chamo lake. The entrance was a short 5 min drive from Paradise lodge. 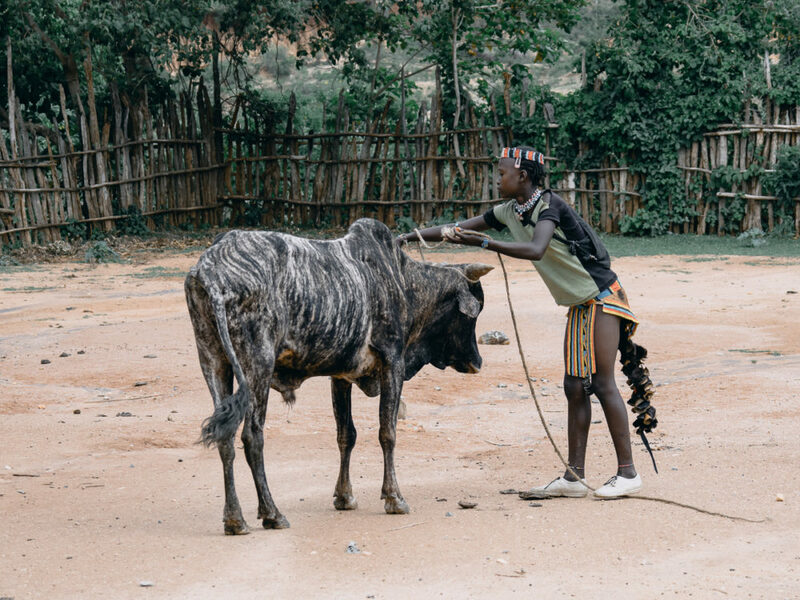 According to Wegderes, It has a large variety of wildlife, like hyenas, baboons, monkeys, Thomson gazelles, even cheetahs and lions, but the cats are very difficult to spot. 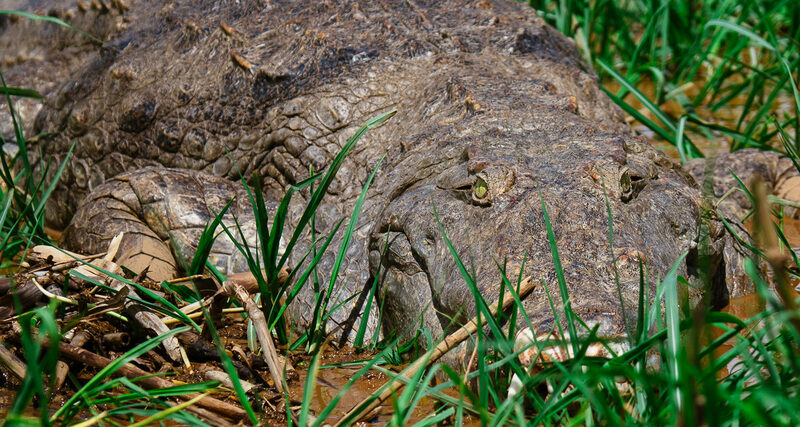 We visited to check its most famous residents, the Nile crocodiles. 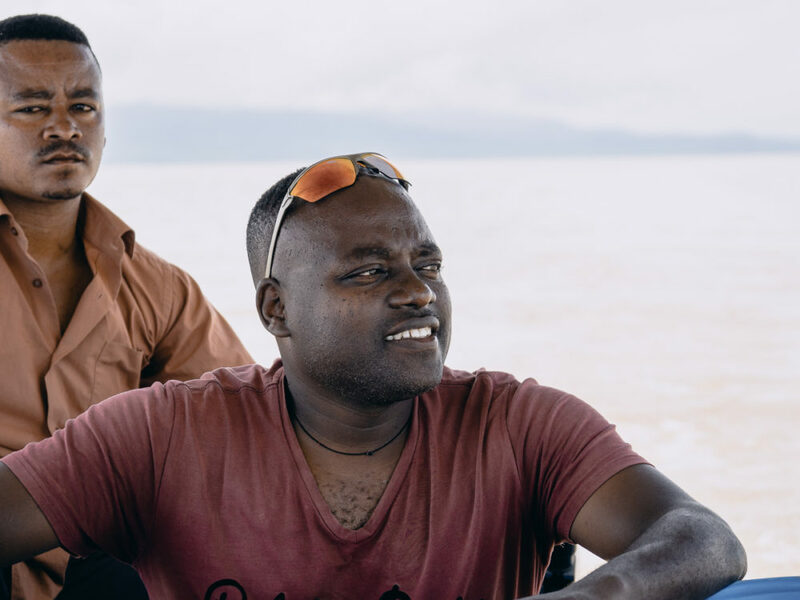 We left the car at the entrance and jumped on a boat together with Wegderes and the boatman. The waters were calm and the nature absolutely serene. 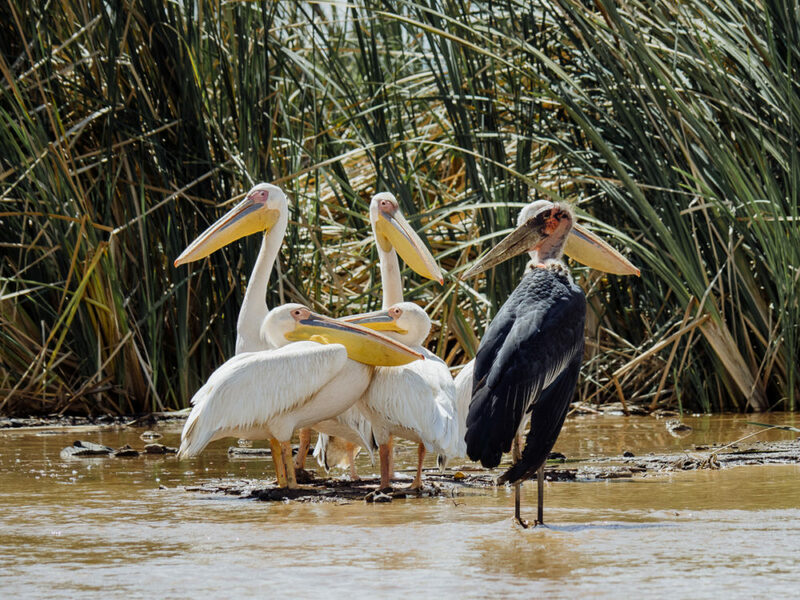 There was a lot of avian life wandering on the banks of the lake with the occasional hippos scattered in the shallows. 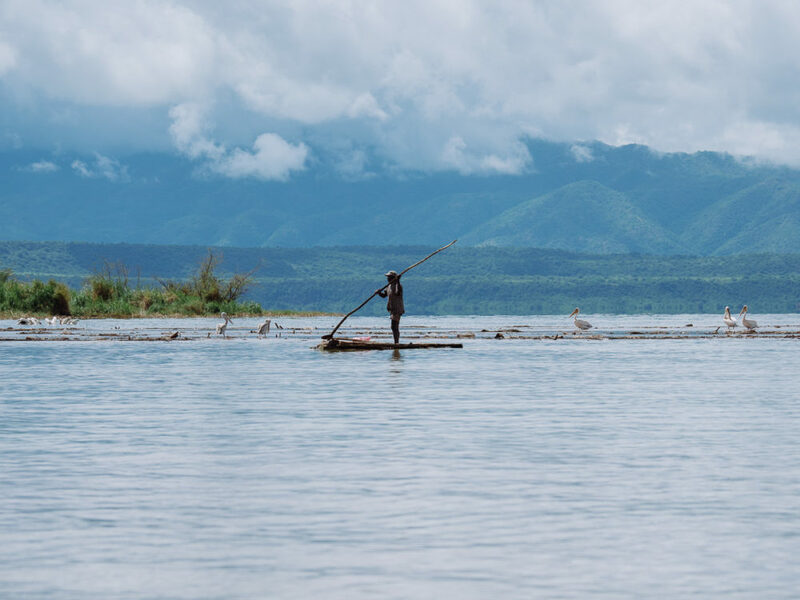 A fisherman in Chamo lake. 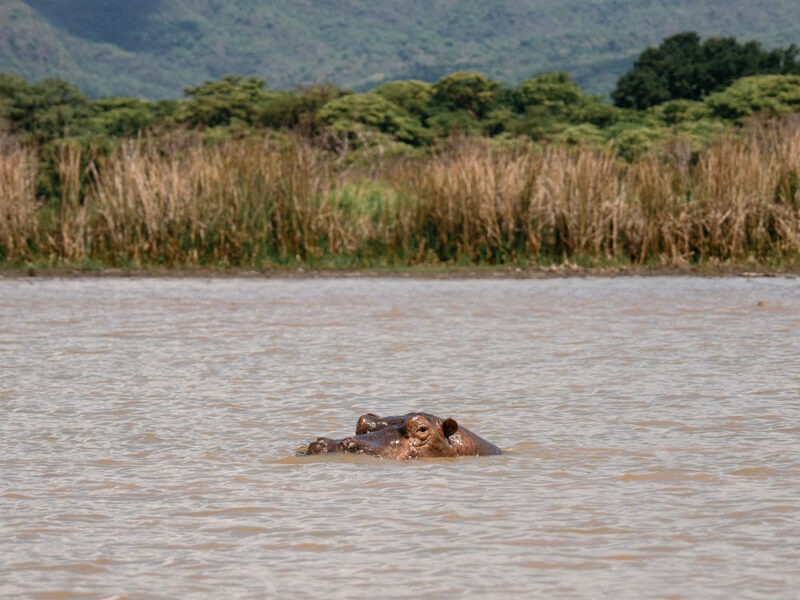 A hippo in Chamo lake. Crocs were abundant. I managed to see at least thirty, some exceeding 5-6 meters length. 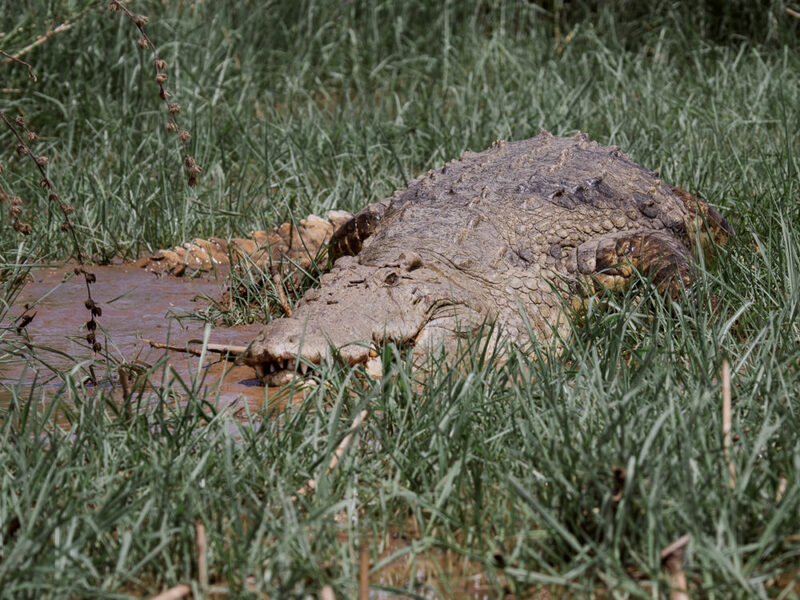 It was the first time I saw crocs in the wild from such a small distance and as with every first time, I was thrilled. 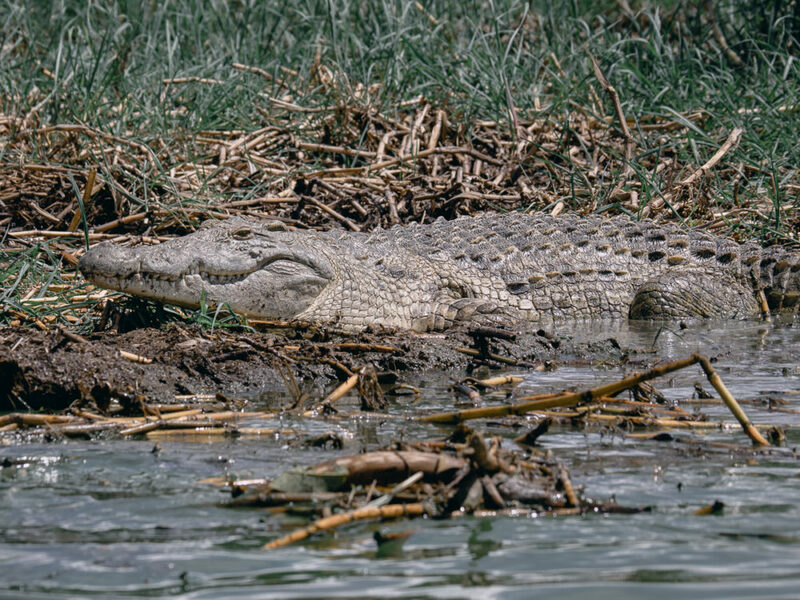 An impessive 6m Nile crocodile in Chamo lake. 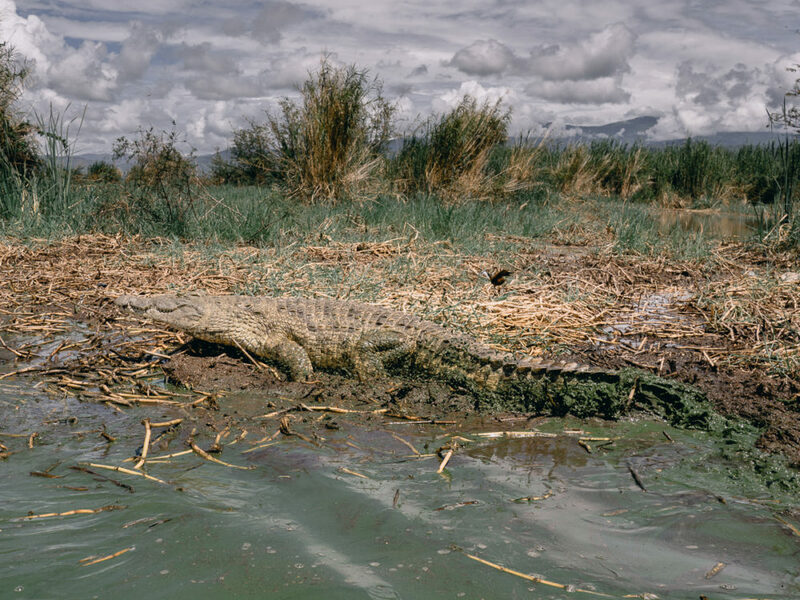 A Nile crocodile in Chamo lake, in Nech Sar Nationa Park. After a long lunch we said to goodbys to Wegderes and went to the small airport of Arba Minch to cacth the Ethiopian Airways flight to Addis Ababa. 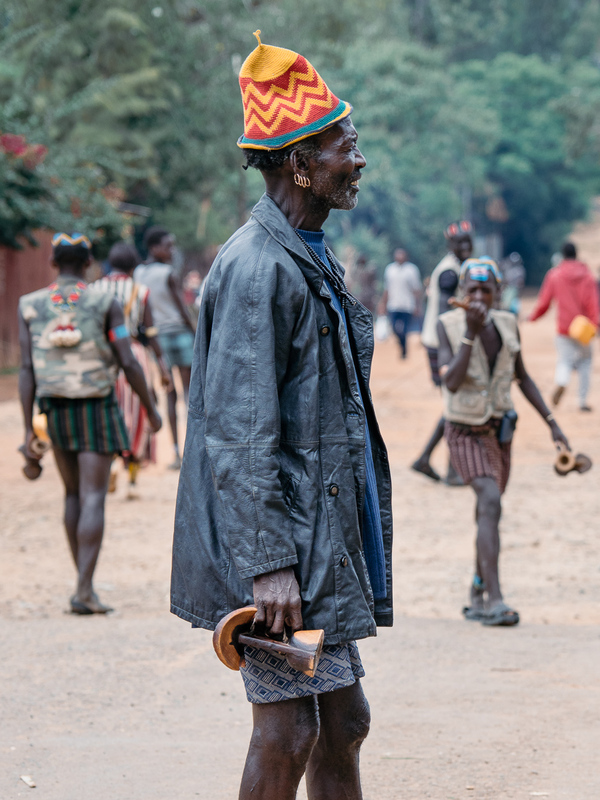 Wegseres, our guide in lower Omo valley. 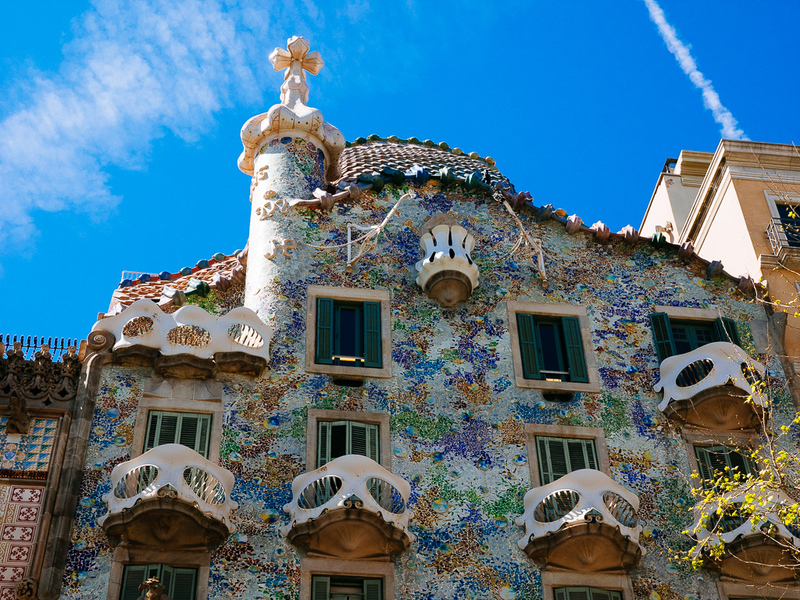 We woke up late to go to the city tour. We went uphill to the Entoto Maryam church and the old imperial palace. The panoramic views of Addis are nice but otherwise there isn’t anything really interesting here. 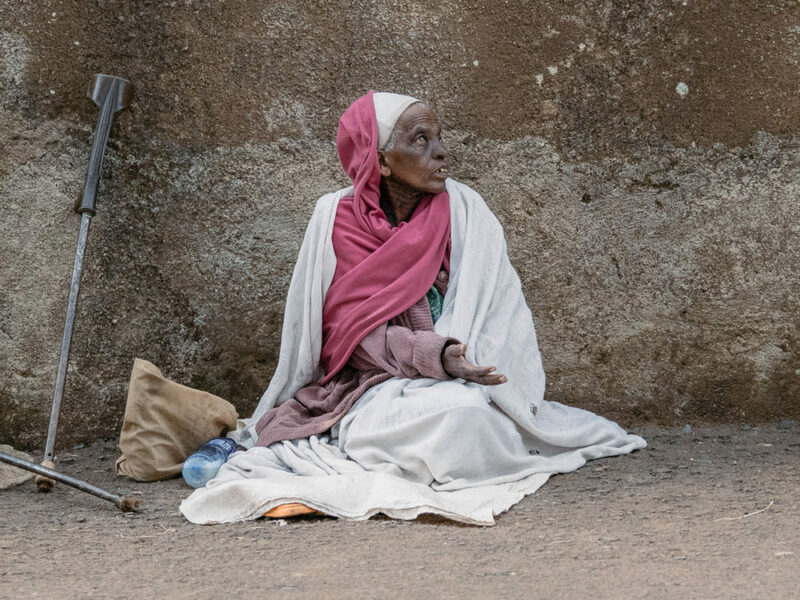 A beggar outside Entoto Maryam church in Addis Ababa. 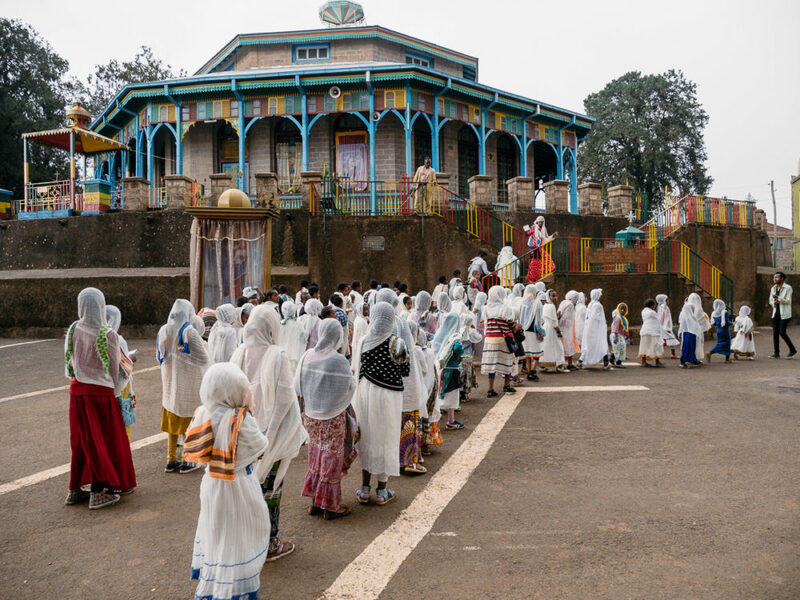 School girls in the Entoto Maryam church in Addis Ababa. 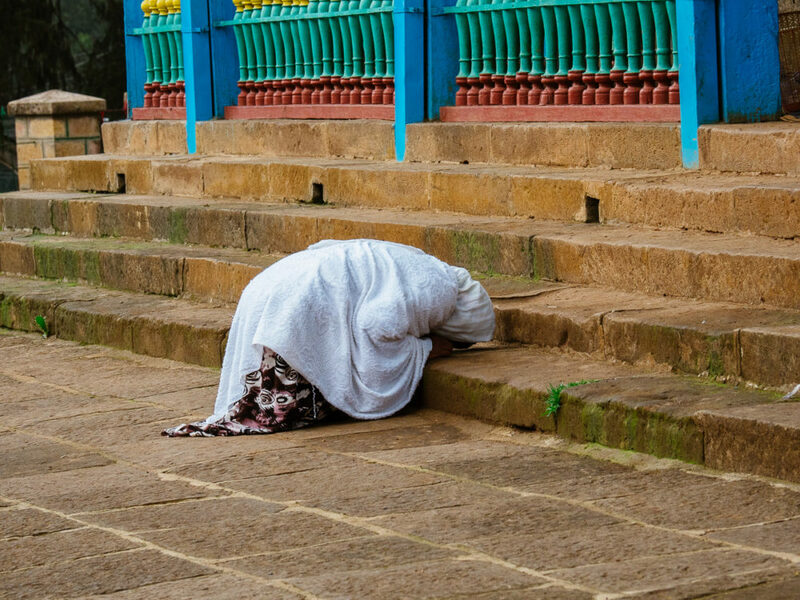 A woman praying at the steps of the Entoto Maryam church, on the hill over Addis Ababa. There are two interesting museums in Addis, the National Museum and the Ethnological museum, housed in the former palace, now the University of Addis Ababa. The Ethnological museum has a nice collection of artifacts organized in a very interesting way, around the different phases of the life cycle: childhood, adulthood and death. Once again, like in my first visit some years ago, there was an electricity cut and I had to use my iphone to navigate hte otherwise very interesting second floor. For me one of the best parts of the museum is the photo exhibition, displaying photographs in black and white of people and tribes around Ethiopia. 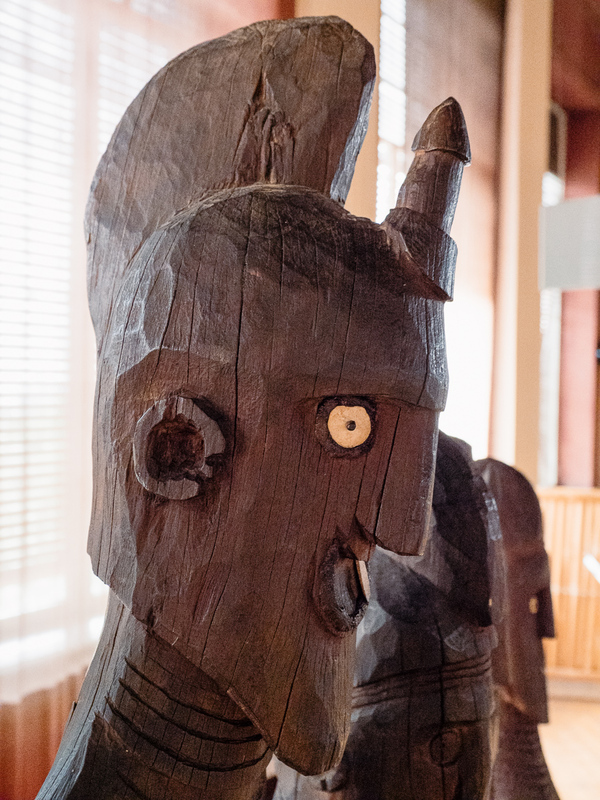 A waga in the Addis Ababa ethnographic museum. 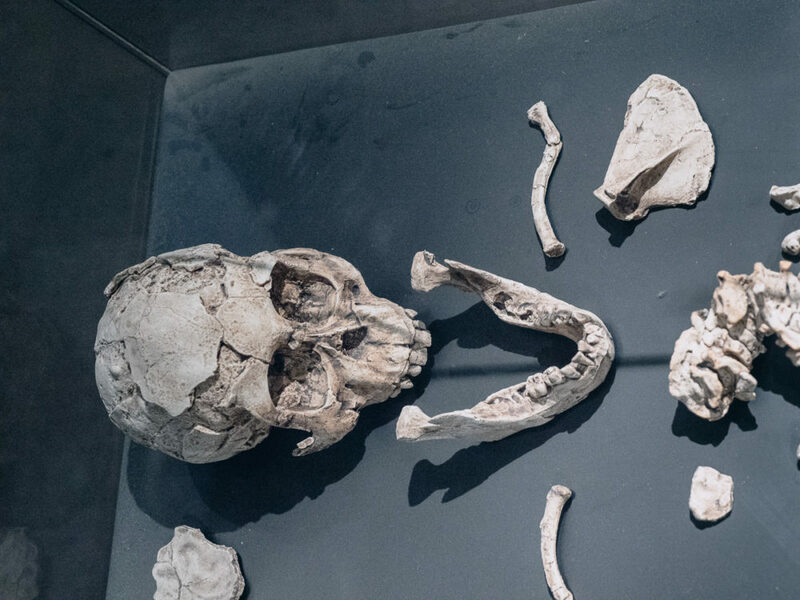 The National museum is poor, but has a famous and thrilling exhibit: Lucy, the fossilized skeleton of an Australopithecus afarensis, an erect female hominid that lived 3.2 million years ago. Lucy – named after the Beatles song, Lucy in the Sky with Diamonds – was the earliest hominid discovered and became famous. 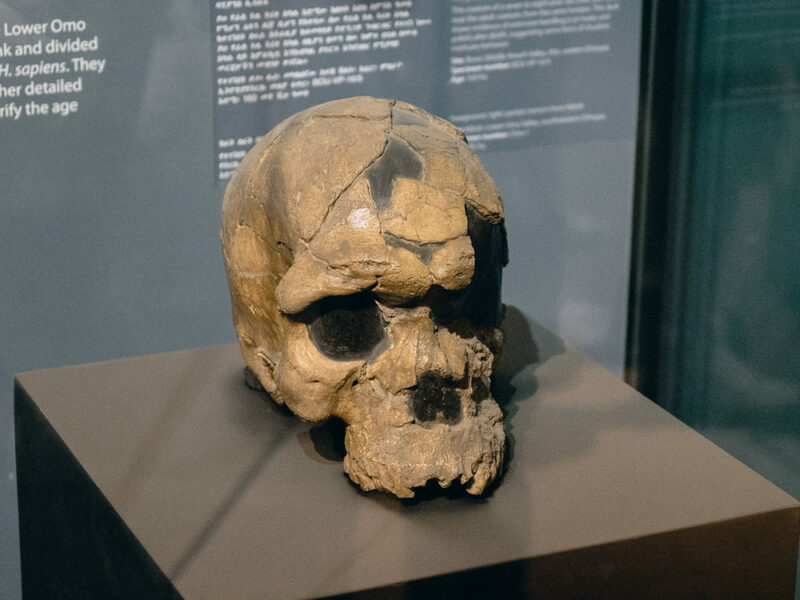 Besides Lucy, there is a rich collection of hominid fossils, the reason why everyone with an interest in our ancestors should visit the museum. Lucy's scull and bones in the National Museum of Addis Ababa. 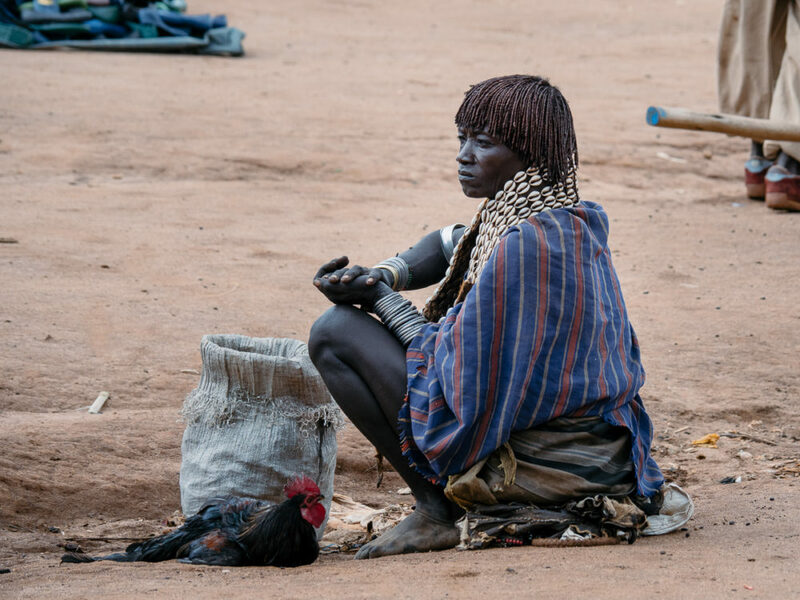 Idaltu or Herto man. The scull of a 160 thousand year hommo found in Herto Bouri, Ethiopia. 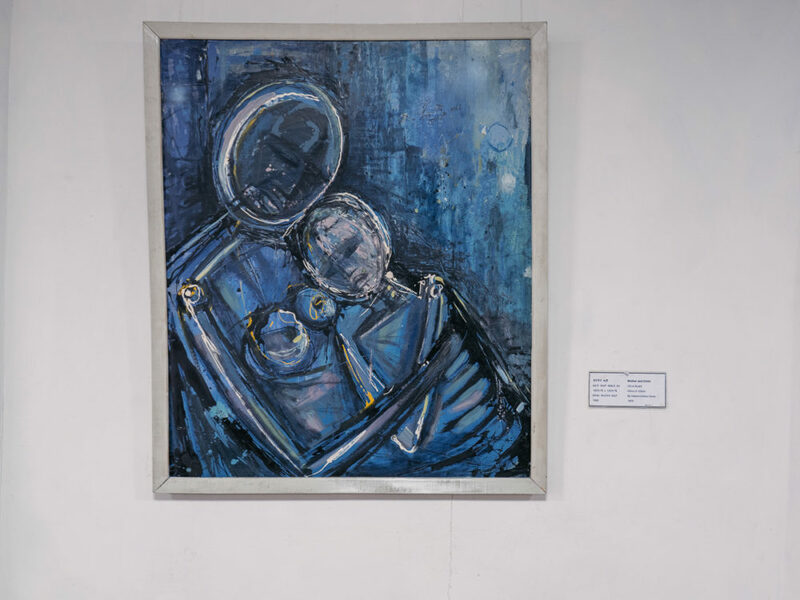 Modern Ethiopian painting by Gebere Kiristos Desta, in the National Museum in Addis Ababa. 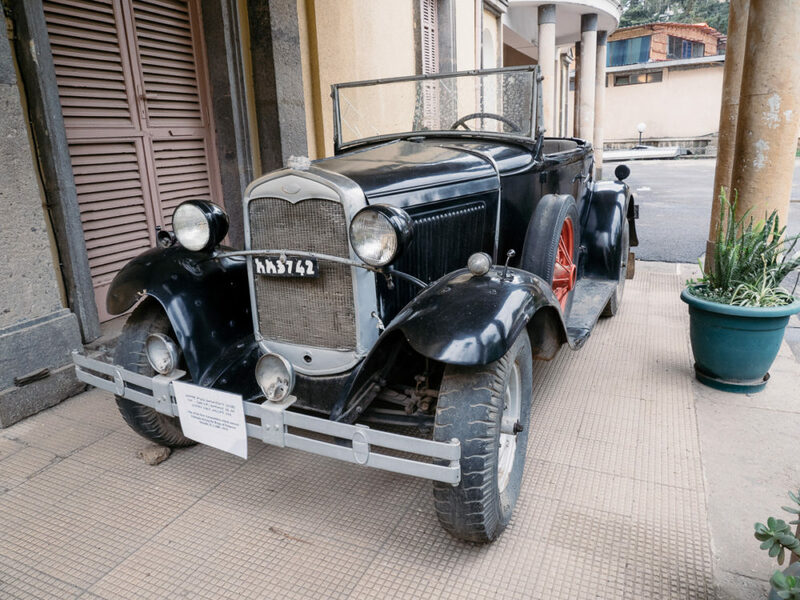 Emperor Menelik II, brought he first car in Ethiopia, today displayed at the National Museum. 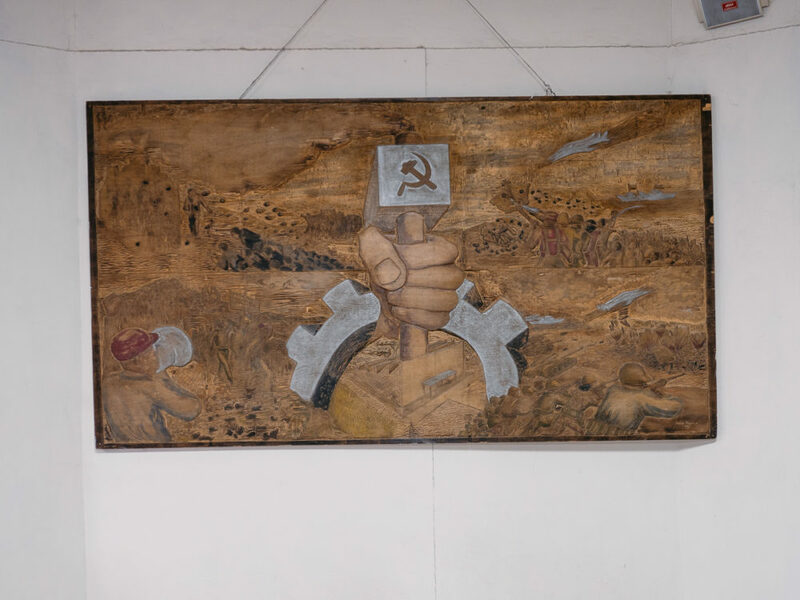 Communist era art in the National Museum in Addis Ababa. 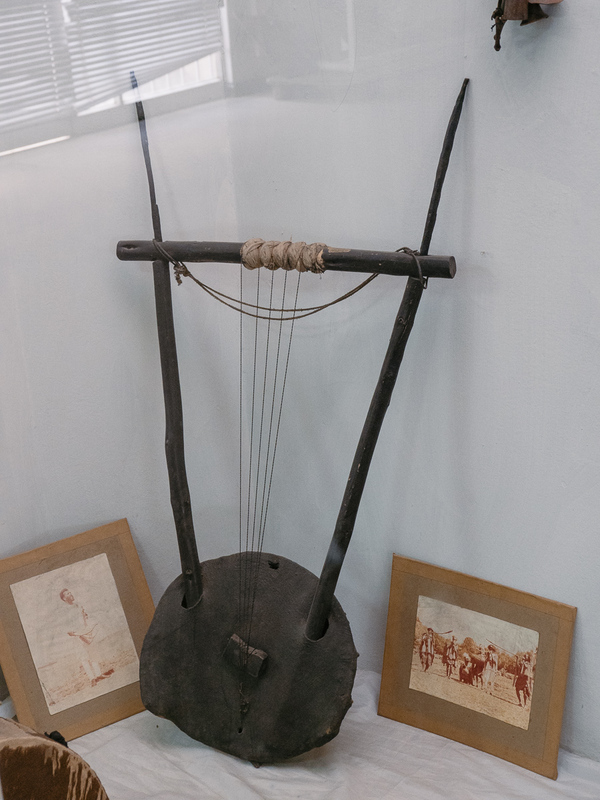 A string instrument, common among Ethiopian tribes. 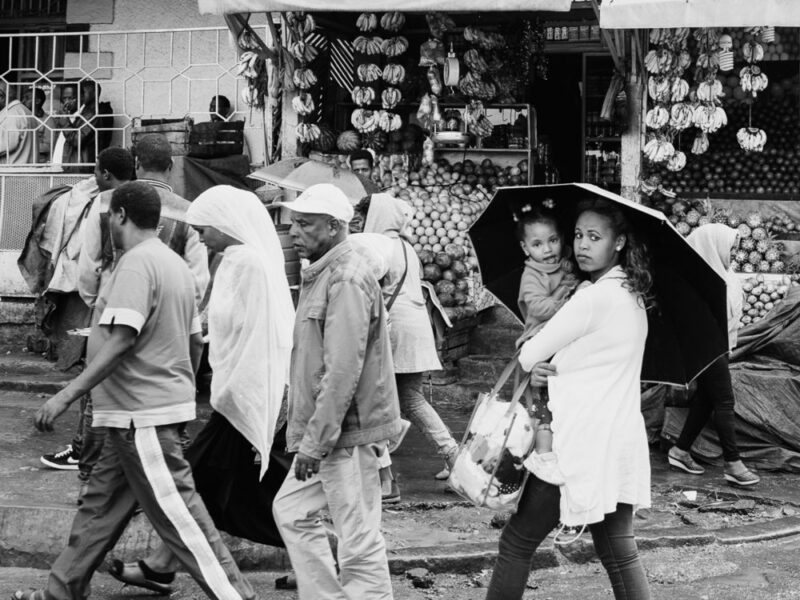 It was raining the whole day, making Addis a bit depressive, but we decided to drive through Mercato, the largest market in sub Saharan Africa. 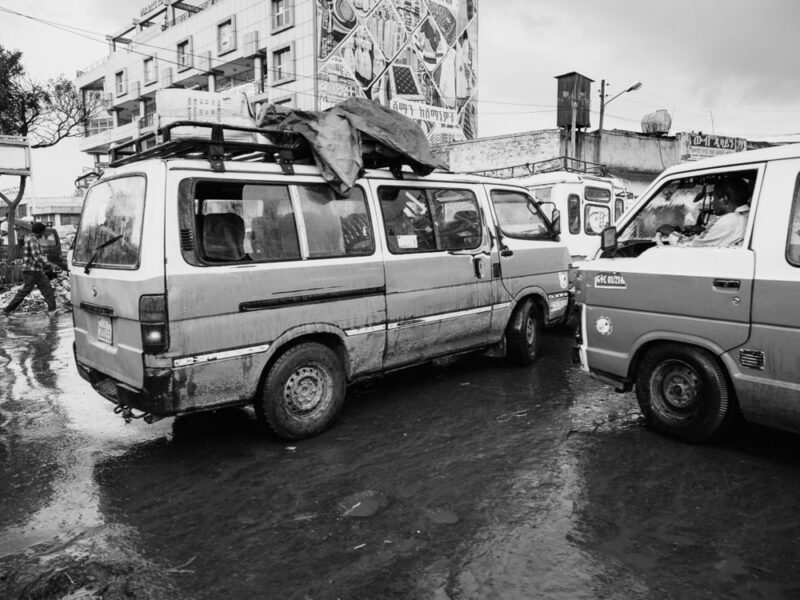 It is a maze of narrow and wider streets with all sorts of tiny shops where most of the commercial activity in Addis takes place. 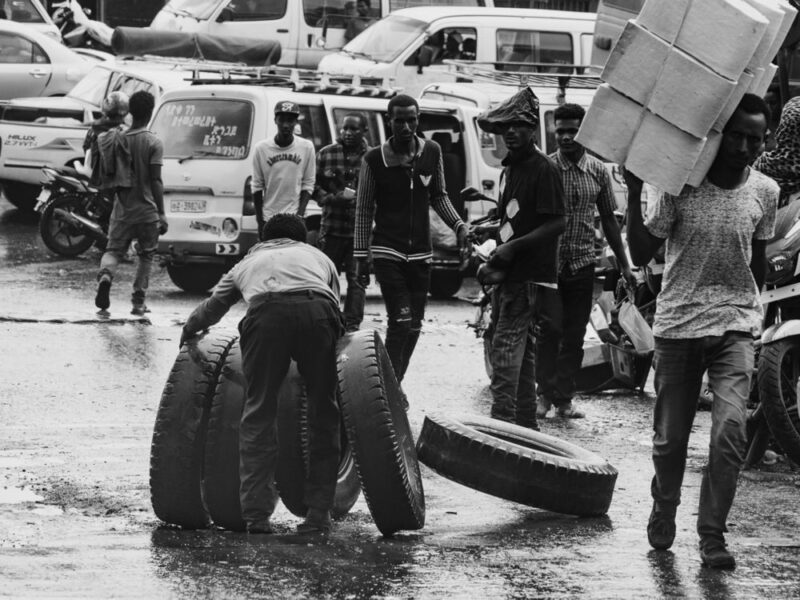 If one wants to see and feel the contemporary life in Addis, this is the place to come to. 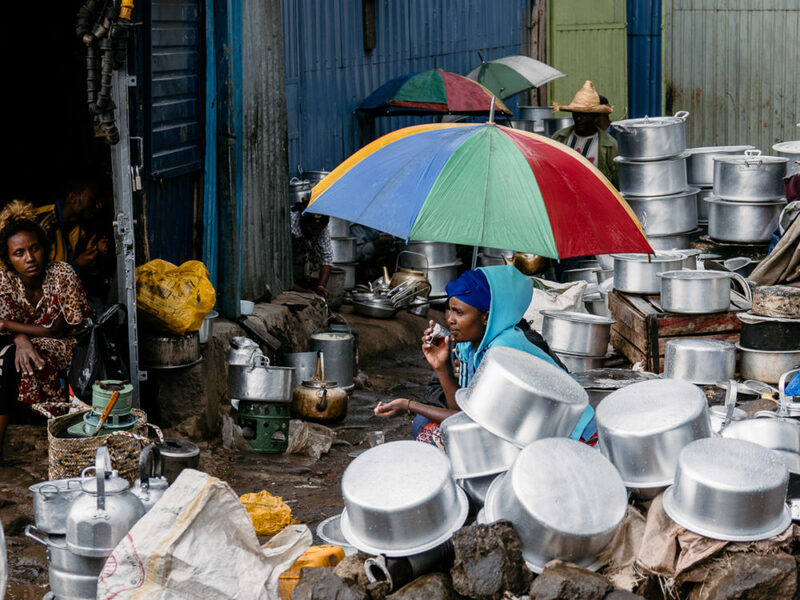 A woman sitting under an umbrella during a rainy day in the Mercato, on one of the largest open markes in Africa. 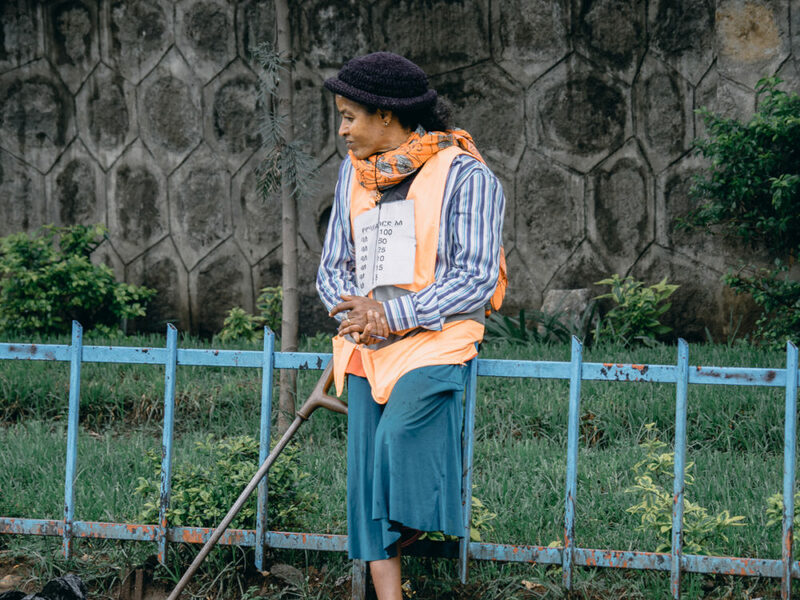 A woman in Addis Ababa. 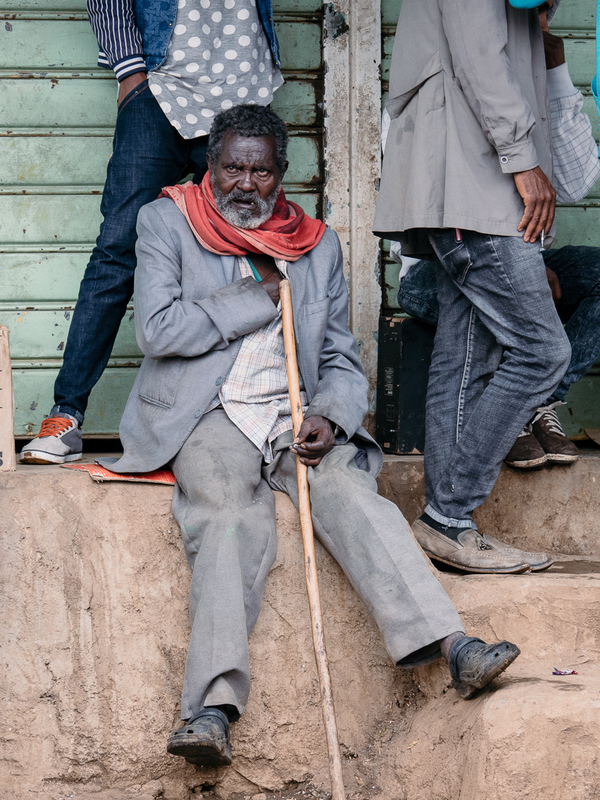 A man in the market in Addis Ababa. 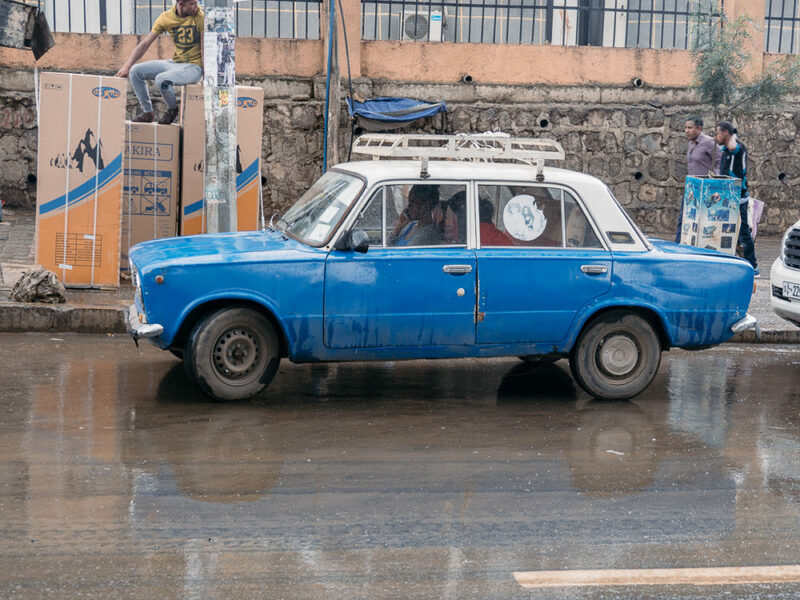 A large number of Lada taxis are still in circulation in Addis Ababa. 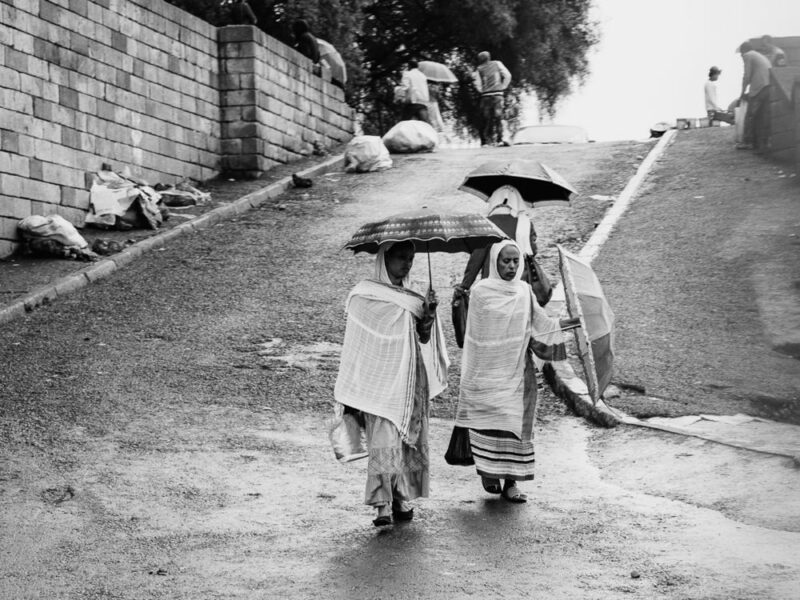 Women and their umbrellas on a rainy day in Addis. 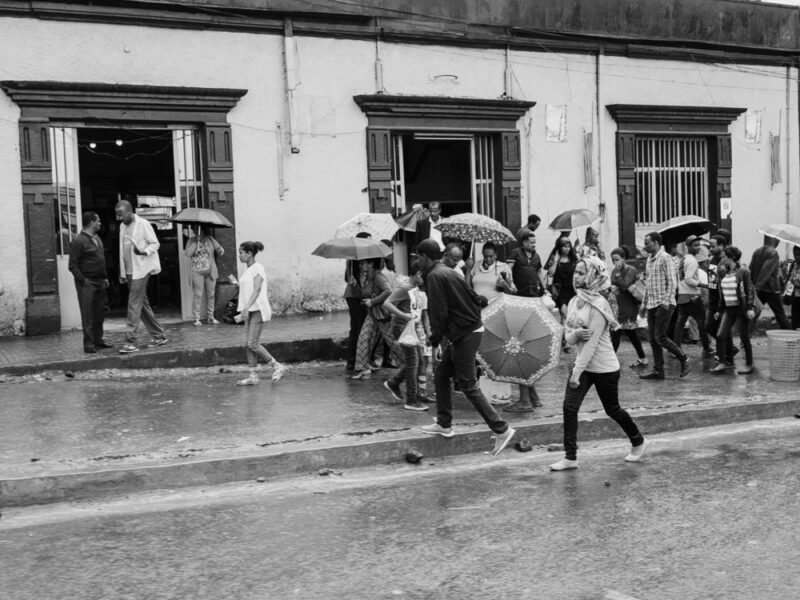 Crowds on a rainy day in Addis Ababa. 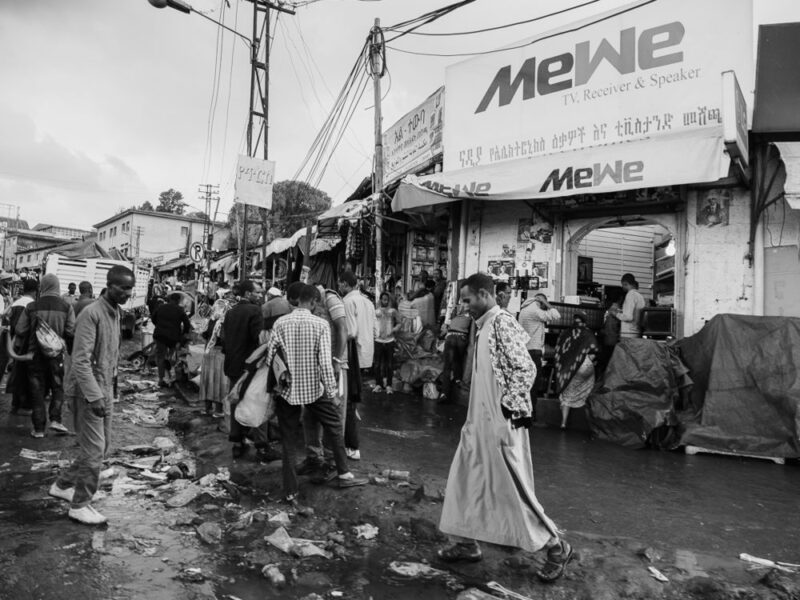 Streets of the Mercato area in Addis Ababa. 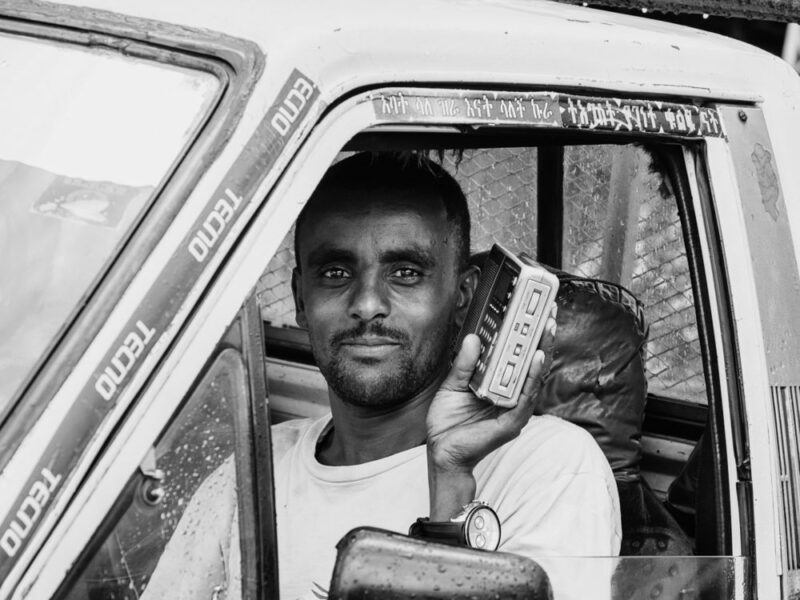 A cool and happy driver in the Mercato in Addis Ababa. The Mercato area there is an ever lasting traffic jam that tests the patience of every driver. 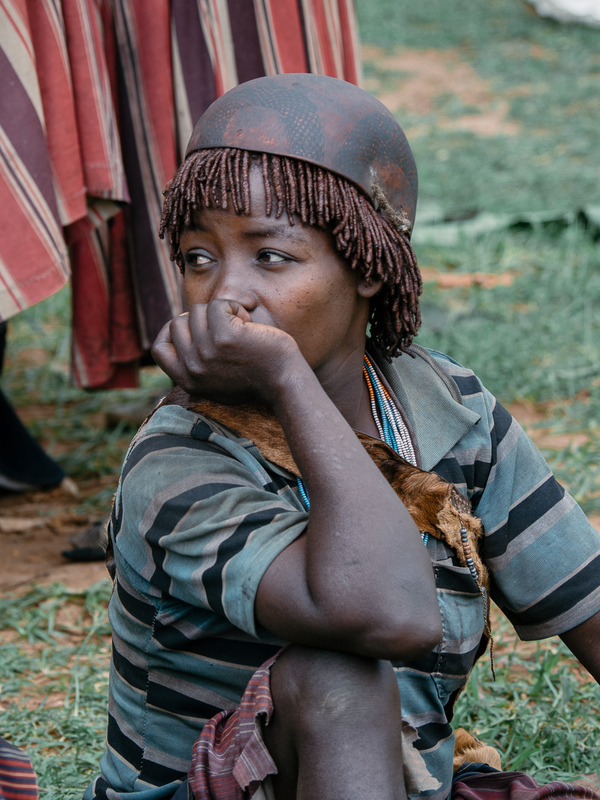 After a week in the valley, I was ready to go back, but Ethiopia has a lot more to offer. Next time I plan to go north to do the historic route and then go to the Danakil depression to check the hottest place on earth.